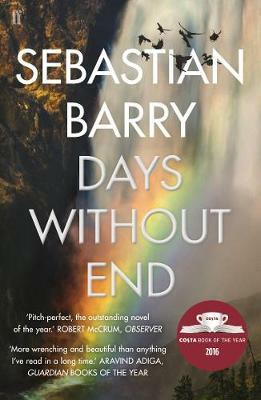 Sebastian Barry has won the eighth £25,000 Walter Scott Prize for Historical Fiction for his epic American novel Days Without End. Barry’s previous novel On Canaan’s Side was a winner in 2012, and he returned to the Borders Book Festival in Melrose, Scotland to receive his Prize from the Duke of Buccleuch on 17 June 2017. Sebastian Barry said on winning the Prize: “It’s difficult to itemise my simple childish joy at receiving this prize; that the judges did all this work to make a 61 year old man feel 12 again." “We have a longer shortlist than usual due to the variety of the longlist, and the fresh perspectives and lively debate generated by the introduction of three new judges to the panel. The judging panel comprised Alistair Moffat (chair), Elizabeth Buccleuch, Kate Figes, Katharine Grant, James Holloway, Elizabeth Laird, and James Naughtie. To qualify, books must have been published in the previous year in the UK or the Commonwealth, and be mostly set in the past - for the purposes of the Prize, at least 60 years ago. This definition comes from the subtitle of Walter Scott’s novel Waverley; Or, ’Tis Sixty Years Since.